When Shinichirou's beloved dog, Flappy, starts acting up and disobeying commands, his trusted vet gives him a strange and unexpected referral: he sends Shinichirou to his long-time friend, Narusawa, a college professor who can apparently communicate with animals. At first Narusawa denies that he has this special skill, but a snarky, talking, black cat gives away Narusawa's secret and reveals that Shinichirou may have this special gift himself...and soon Shinichirou is hell-bent on becoming Narusawa's "pupil." Will Narusawa give in to his advances? And if he does, will Shinichirou come to regret it? 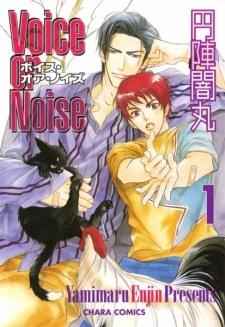 Voice or Noise had three volumes published in English by Tokyopop under Blu Manga imprint from November 13, 2007 to August 3, 2010, before the publisher went defunct.